The entire Horsemen catalogue is Essential Viewing. They are the measuring stick for all wrestling alliances that came after them, cutting the best promos of all time, and working legendary matches that made them the quintessential heels for an entire generation in-and-out of the ring. The great target of the 1980s Horsemen was Dusty Rhodes. From a creative standpoint, Dusty was the perfect foil for The Four Horsemen. He was on par with the group’s leader Ric Flair in terms of promo ability and represented the honesty and fundamental goodness of which The Horsemen were bankrupt. 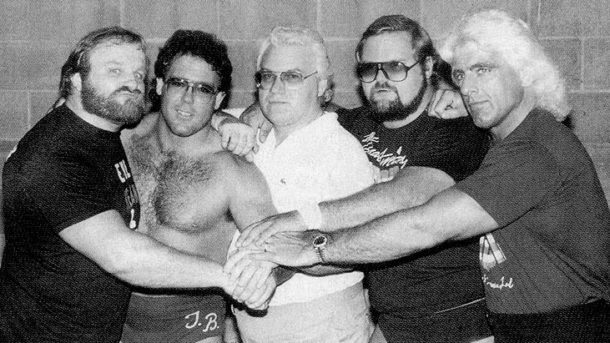 Practically speaking, however, Rhodes, the booker of Jim Crockett Promotions at the time, knew a good thing when he saw it and kept himself as close to the white-hot Horsemen as possible. Even in light of these blatant political machinations, Dusty vs. The Horsemen was a great feud. Rhodes and Flair main evented Starrcade ’84, but in the subsequent year, The Four Horsemen were assembled, which allowed the NWA to build towards another Flair-Rhodes showdown with a powerful, natural way to stack the odds against superface Dusty. In the buildup to Starrcade ’85, Flair and The Horsemen jumped Dusty in one of the most memorable moments in NWA history, breaking his leg inside a steel cage in a vicious attack that shocked the fanbase. The injury angle got over like free money and catapulted Dusty towards a monumental title win at Starrcade. The bit was so good that it even worked the second way around less than a year later when The Horsemen broke Dusty’s arm in a legendary segment. The Horsemen kidnapped a cameraman, forced him to travel with them as they stalked Rhodes, and ultimately jumped The American Dream in the parking lot of JCP headquarters, smashing his arm with a baseball bat. (Dusty famously shouts “MAKE IT GOOD!” just before the moment of truth.) The segment was so revolutionary and gritty that fans watching on TV called local police to alert them of an assault in progress – seriously. The moment cemented The Four Horsemen as the most lowdown, despicable heels in the territory, and was so highly-regarded within the industry that it was copied over a decade later by the nWo. Of course, these segments, in spite of their greatness, wouldn’t have meant a thing if The Horsemen hadn’t delivered in the ring with Dusty. As this match (oddly dubbed for Japanese broadcast complete with awesome Japanese commercials) illustrates, The Horsemen knew how to get heat and build anticipation for their opponents comebacks. The match sees Flair and the Andersons (The Minnesota Wrecking Crew if you will, daddy) take on Rhodes and The Rock n’ Roll Express, who were at the time just about the three biggest pure babyfaces in wrestling this side of Hulk Hogan. Their offense, while smooth and expertly-executed, was never flashy, and the goal was always to build the next hope spot for their babyface opponents. As seen in the above match, the Andersons worked a largely punch-kick style, an effective heel tactic of the era. However, The Horsemen came into their true prime with Ole’s retirement in 1987. This allowed Arn and Tully to become the group’s tag team in residence, which was good, considering Arn and Tully are a prominent part of the “greatest heel tag team ever” discussion. Arn was big, strong, and no-nonsense, but could bump like a jobber – which is a compliment – while Tully was essentially a midcard version of Ric Flair. Arn looked as credible as anybody in the ring while Blanchard bumped, begged off, and strutted in a way that incensed the crowd. They were the perfect heels in that they were simultaneously dominant and beatable. Arn and Tully could — and frequently did — wrestle jobbers and have a great match as easily as they could with two main eventers. It’s a testament to Anderson and Blanchard that the golden age of The Four Horsemen ended the second they left for the WWF (where they were known as The Brainbusters and had a memorable feud with Demolition). As the 80s became the 90s, it felt like the era of The Horsemen was over. During wrestling’s creative nadir in the early 90s, fans and promoters remembered the greatness of The Four Horsemen, and trying to recreate that instead of build something new felt like a good idea. Whether it was a face run incorporating Sting in the group or a heel run with “Pretty” Paul Roma, these incarnations never had the flair (no pun intended) of the original lineup. The later versions of The Four Horsemen had some really talented members (Brian Pillman, Dean Malenko, HE WHO SHALL NOT BE NAMED), but they always fell miles short of recapturing the original magic. Even as the act’s long-standing mystique fizzled, “The Four Horsemen” remained a brand that wrestling fans recognized and respected. When presenting the nWo as beatable finally seemed like a good idea two years too late, WCW used none other than The Horsemen (now featuring way-worse-than-Roma Mongo McMichael) as their logical opponents. By this time, though, WCW had strayed too far for any group, no matter how legendary the name, to make an impact. And so it was that along with WCW, The Four Horsemen ultimately died not with a bang, but a whimper.